After baking cheesecake with sour cream and one with ricotta cheese, I thought I would try something different. 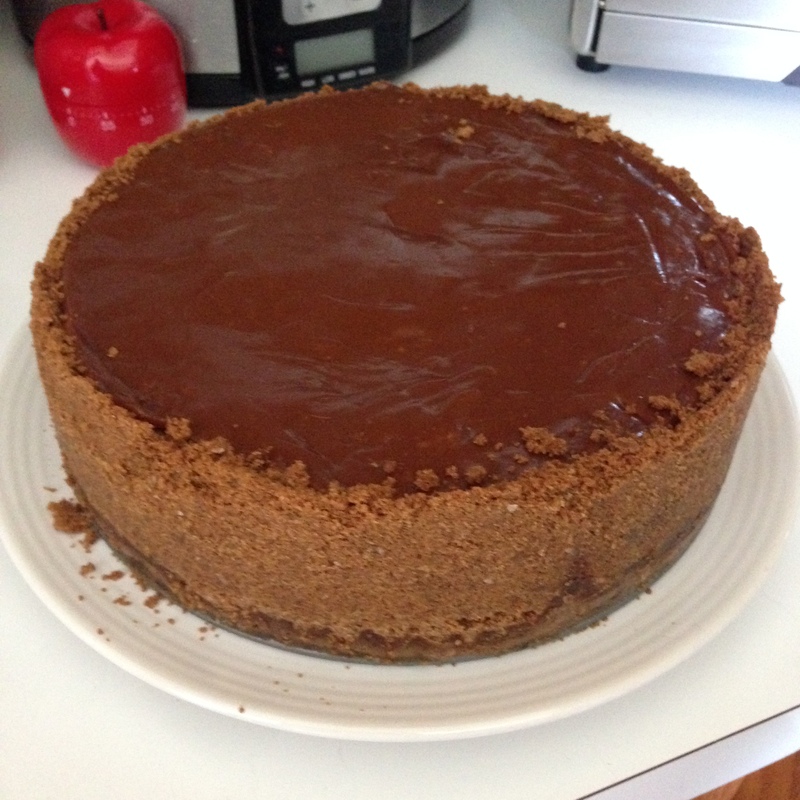 I thought this recipe for a salted caramel cheesecake sounded good, using dulce de leche. I didn’t think it was that great of a dessert, though, partly because of baker error (I over-cooked the caramel topping) and partly because I didn’t like the consistency of the cheesecake. I like cheesecake that is thicker, but I found this one to be more pudding like. I also couldn’t find dulce de leche, so I made it using sweetened condensed milk instead, which may have affected the recipe in a negative way. Perhaps there is a better way to make dulce de leche? Because I over-cooked the caramel topping, it hardened so much upon cooling that I had to use kitchen shears just to serve individual slices. It wasn’t as big of a hit with the crowd, either, though I brought it to the gym a few days later, and my fellow CrossFitters devoured it. I like the premise of this cheesecake, but I think it needed better execution. I might use my preferred ricotta cheesecake recipe with a salted caramel swirl next time, being careful to properly cook the caramel! For the dulce de leche: Heat oven to 425 degrees. Pour sweetened condensed milk into a 9″ deep dish pie plate or 8″ x 8″ square pan and cover with foil. Set inside a 9″ x 13″ pan and add enough hot water to the larger pan to reach halfway up the smaller pan. Bake in middle of the oven for 45 minutes, or until sweetened condensed milk has turned thick and brown. Remove pan from water bath and cool. For the crust: Reduce oven heat oven to 375 degrees. In a food processor, grind graham crackers into crumbs. Add sugar and salt, pulsing to combine. Add melted butter through the feed tube with the motor running. Process for a few more seconds until combined. Transfer the graham mixture to a buttered 9″ or 10″ springform pan. Pat the crumb mixture into the bottom of the pan and up the sides if preferred. Bake crust 10-12 minutes or until slightly browned. Allow to cool. For the cheesecake: Reduce oven temperature to 300 degrees. In the food processor, beat cream cheese until smooth. Add dulce de leche and process to combine. Add flour, salt, sugar, and vanilla, beating until smooth and fluffy (about five minutes). Beat in the eggs one at a time until just combined (about 30 seconds each). Pour the cream cheese mixture into cooled crust. Prepare a water bath for the springform pan, then bake for 60-90 minutes or until the center is only slightly set. Cool cheesecake completely before covering and refrigerating overnight. For the topping: In a large saucepan over medium heat, combine sugar and water, swirling to combine. Cook until sugar turns golden brown (about 3-5 minutes). Add salt and vanilla. Continue to whisk. Return saucepan to medium-low heat. Whisk caramel until smooth, then allow to cool for 15 minutes. Remove cheesecake from the refrigerator and pour caramel sauce over the top. Return cheesecake to the refrigerator to allow the caramel to set for approximately 30 minutes before serving.